Home Learning Center Off Grid Why use a blocking diode in off-grid solar systems? Why use a blocking diode in off-grid solar systems? A diode conducts current in one direction only. Apart from rectification of alternate current (AC), which is by far the major application of the diode, one of the applications of diodes is blocking reverse current. Solar modules produce variable direct current (DC) voltage. When the sun shines, the module can supply current to a battery. But what happens during the night or on a cloudy day if the battery is left connected to the module? 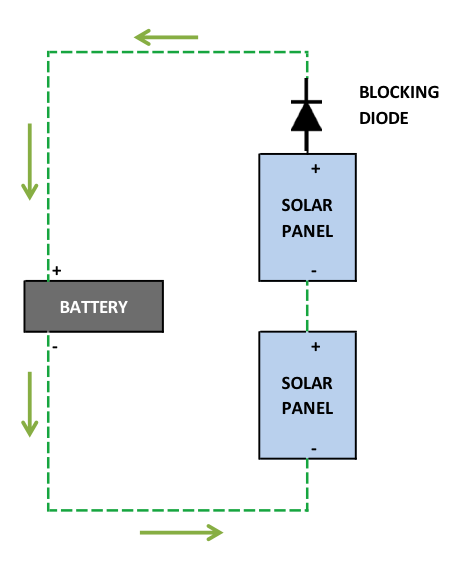 At night, the solar module is connected to the battery, but produces zero volts. It acts more or less like a resistor which will drain current from the battery unless we take some protective measures. A blocking diode, or more appropriately, a reverse blocking diode placed in series in the current circuit is one such measure. If it is placed in the higher side of the down lead, the cathode connects towards the battery and the anode towards the module. A reverse blocking diode is required where the modules supply current directly to a battery. On-grid solar systems normally use no batteries, and in any case, have much better protective systems built into them. The use of a reverse blocking diode is also unnecessary where a charge controller (or regulator) is used to charge the battery. A good charge controller will have all necessary protections built into it. A diode in the current circuit will always waste some energy. The power so lost is the product of the diode forward drop and the current. While charging a 12 V battery, you can expect about 5% of the power to be wasted in the diode. If a charge controller is not available, a relay of sufficient rating can be used to connect the panel to the battery when solar power is available, and to disconnect it when the solar voltage falls below the acceptable level. I have a windmill driving a 60 amp 12 volt semi-truck alternator into a battery storage system. I need a blocking diode to prevent the discharge of the batteries back through the alternator when wind speeds are too low. What size diode should I use and where can I purchase them. What do they cost?